Certain of the Yarmouth street lines (e.g. George Street) appear to date from the early Medieval period (Rogerson, 1976, 235). The origin of the Rows is less clear: parcels of land known as rengatae (ranges) were documented in the late 12th century (Rutledge, 1990, 44). The existence of the Rows proper is suggested in several early 13th century documents, and their existence is confirmed by 1280 (Rutledge, 1990). It is unlikely that the Rows are a development of the Medieval burgage plot: Burgage plots (long, thin urban properties) tended to have a building at the street end, facing end on into the street, with a yard to the rear, as evidenced in London, York, Lincoln, Worcester, Aberdeen and Perth (Vince, 1990, 29, 2003, 256, Carver, 1980, 9, Ottaway, 1992, 175, Bowler and Perry, 2004, 25). In general, burgage plots are not separate from one another, and so present an unbroken street frontage. 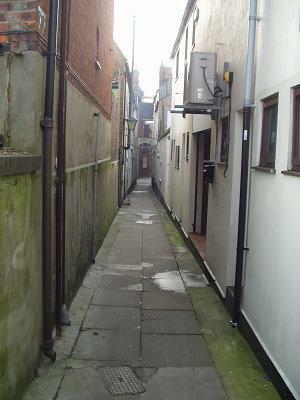 In Yarmouth, however, each plot is separated by a narrow lane (the Row). In addition, Yarmouth rengatae seem to be wider than most burgage plots, although this may not be significant, as both burgage plots and rengatae varied in width. Whilst most burgage plots measure about a pole in width (5.2m, 17 feet), some are noticeably larger. 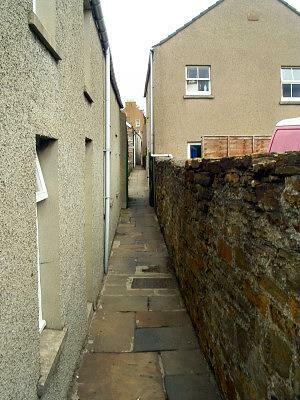 In St. Andrews, for example, many plots are between 11 and 11.5m wide (36 feet to 38 feet) and in Dunfermline, many measure up to 10m wide (33 feet) (Coleman, 2004, 287-288). In Yarmouth, rengatae varied from 7.3m (24 feet) to 25.6m (84 feet) (Rutledge, pers. comm., see below), suggesting a less formal method of town planning. Palliser et al. suggest that the Rows are a variant of classic Medieval waterfront development, where plots are lengthened by constructing wharves out into the river (and making ground by tipping rubbish into the river). The resultant plots are long, narrow tenements divided by narrow lanes, running from the earliest harbour street back to the waterfront (Palliser et al., 2000, 170ff). Landscape formation modelling as part of the Great Yarmouth Archaeological Map suggests that the formation process may be similar for the most westerly of Yarmouth's Rows. However, this cannot be the case for the more easterly Rows, which face away from the river and hence do not have quaysides. It is unlikely that the easterly and westerly Rows were connected, as many of the Rows are not continuous across Howard Street and George Street, suggesting a more coherent early town plan. The Rows are fronted with houses along their entire length. It is likely that most of the dwellings along the Rows developed from infilling of rengatae in the 13th century (Rutledge, 1990, 44). It is possible that the Rows developed from a Scandinavian style of street layout, as the nearest similar street systems appear to be in Kirkwall, in Orkney, Birka in Sweden and in parts of Hanseatic Bergen, in Norway (B. Ayers, 2005, pers. comm.). There is certainly Scandinavian influence visible in the town, not least through the names of streets such as Middlegate (gata is a common Scandinavian suffix, meaning street). There is documentary evidence for a Northgate (not to be confused with modern Northgate Street) and a Southgate (Rutledge, 1990, 44). The early name for Fullers Hill, the Howe, is also of Scandinavian origin. Considering the position of the town, and the date of its founding, however, it would be more surprising if there were no traces of Scandinavian activity in Great Yarmouth. Despite heavy bomb damage in the Second World War, and vigorous post-war slum clearance by the Ministry of Works, areas of the Rows survive along the South Quay, beside the Market Place and along King Street. 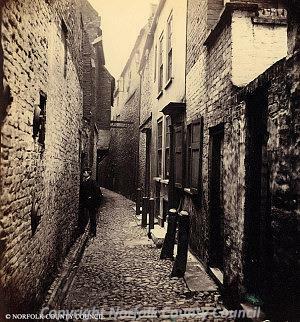 There is also a large volume of historical photographs of the Rows on the Picture Norfolk website. Click here for the Great Yarmouth bibliography.